The IP based Monitoring System 700 represents the technological top product of the manufacturer Didactum. Additional Text: The IP based Monitoring System 700 represents the technological top product of the manufacturer Didactum. Product information "Monitoring System 700"
The IP based Monitoring System 700 represents the technological top product of the manufacturer Didactum. Contract manufacturing takes place within the EU. Before delivery to the customer, each Monitoring System 700 is put through its paces for full 7 days. Monitoring System 700 is a complete solution to protect your mission critical infrastructure. This remote monitoring unit combines environmental monitoring with security monitoring, video monitoring, power monitoring and I / O dry contact monitoring. The 700 remote monitoring unit is a stand alone monitoring solution. You do not have to install software on your PC or server. Simply access the multilingual web interface with the web browser of your laptop, PC, smartphone or tablet. An integrated setup wizard guides you through the main settings of this IP driven remote monitoring device. 2* bi-stable latching relays for switching ventilation systems, pumps, etc. 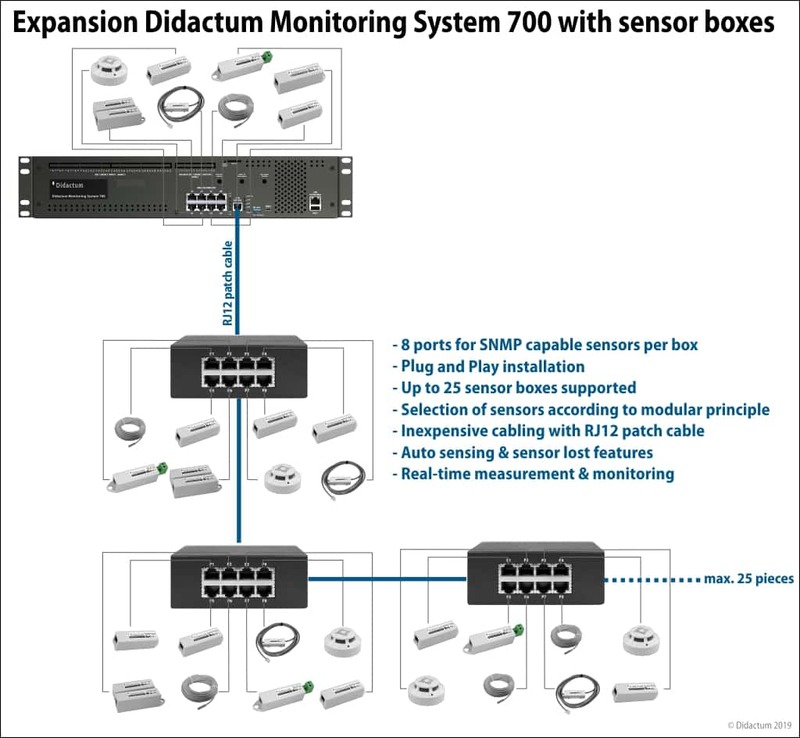 The Monitoring System 700 can be equipped with every analog sensor of Didactum’s extensive sensor portfolio. If you want to monitor critical physical conditions such as temperature, humidity (rH) or air flow, just select the environmental sensors. Do you want to protect your mission critical infrastructure against fire or water leakage, manufacturer Didactum offers IP based smoke detectors, water detection sensor and water leakage cables. Sensors for the reliable detection of escaping gas are also offered. Increase the safety of your rooms and facilities by installing intelligent sensors for remote security monitoring. Simply connect PIR motion detectors, door contacts, glass breakage sensors and vibration detectors to your IP based remote monitoring device. Voltage and current can be measured and monitored with the support of precise AC and DC power sensors. If more intelligent sensors are needed, simply attach the optional sensor expansion unit. Each unit offers 8 additional sensor ports for Didactum`s analog sensors. The IP based Monitoring System 700 can be combined with several sensor expansion units, so more than 200 sensors can be measured and monitored in real time. The base model of the IP-based measurement and monitoring system 700 is equipped with 32 inputs and 8 isolated outputs for the Ethernet connection of Dry Contacts. Here you simply connect with a 2 wire cable the relays and dry contacts of your mission critical HVAC systems. UPS, diesel generators, alarm and security systems can also be connected. Many machines and building systems are also equipped with Dry Contacts, so they can also be integrated into the non-stop remote monitoring of the IP-based Monitoring System 700. On request, this monitoring device can be equipped with up to 96 dry contact inputs and 24 dry contact outputs. To do this, simply select on the right side the number of required Dry Contact Boards. If you want to monitor and control an even higher number of dry contacts, such as a Wiring Closet, you can also connect the optional Dry Contact Expansion Unit to the main control unit. In the case of critical events (power failure, defective air conditioner, smoldering fire, water damage, unauthorized access, burglary, etc.) or physical status changes (heat, static discharge, etc. ), the responsible employees must be notified and alerted without any compromise. Here, the networked Monitoring System 700 offers a variety of notification and alerting options such as E-Mail and SMS (via opt LTE modem or E-Mail to SMS gateway). Audio visual alarms can be output with the siren with built-in flash. For each connected sensor, individual limit and warning thresholds can be easily defined in the integrated logics of Monitoring System 700. Actuator functions, such as automatic switching of the built-in bistable (latching) relays, are also supported. The content of the notification or alert can be customized with the support of the innovative Didactum macro function. If you have connected a video camera to you remote monitoring unit, pictures of the critical event can be included in the alert message. The SNMPv1 / v2c / v3 enabled Monitoring System 700 can send SNMP Traps to SNMP tools, Network Management Systems (e.g. Nagios, OpenNMS, WhatsUp Gold, Zabbix, etc.) or building monitoring software. All events and critical status changes - including date and time - are stored in the syslog of the Monitoring System 700. The syslog can be sent by FTP upload or by e-mail to the control room or the company headquarters and evaluated from there. Related links to "Monitoring System 700"
Delivery Monitoring System 700, 2 U; EU model with internal 230V AC power supply; including 1x C13 power cable & 1x RJ45 network cable, including 1x Dry Contact module 40 and 19 " rack mounting kit; sensors and LTE modem not included. Please order separately. Customer evaluation for "Monitoring System 700"